Skin is the main route to allergen sensitization and provides protection from exposure to exogenous factors like microbes, pollutants, ultraviolet radiation (UVR) and nanoparticles (NPs). Skin immune cells (Langerhans cells-LCs) migrate to the lymph nodes following allergen exposure as in the case of Contact Hypersensitivity (CHS). LCs also play a role in developing immune tolerance to UVR that protects us from sun allergies. Although the current immunologic mouse model of CHS using chemical allergens (haptens) demonstrates the suppressive effect of UVR, what the model lacks is the role of NPs in altering antigen presentation by LCs and the subsequent effect on immune tolerance. 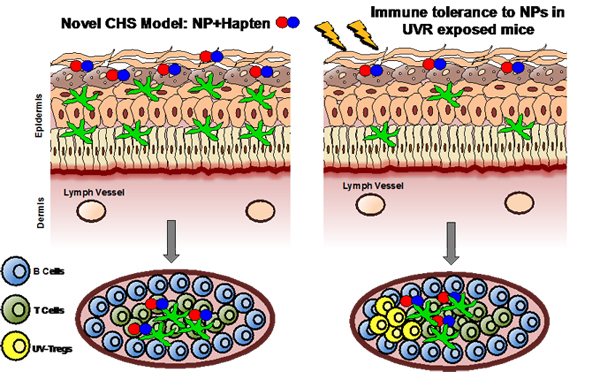 We are investigating a novel CHS model to study the effects of UVR-induced immunosuppression in correlation to the barrier defect produced in the skin, charge of NP used and the pivotal role of LCs in the process, by incorporating NPs along with established chemical haptens in the sensitization and challenge phase of the CHS response. This mimics a more realistic scenario as consumers often apply sunscreen containing NPs (Titanium dioxide, Zinc oxide) post sun exposure. We hypothesize that Quantum Dot (QD) NPs combined with chemical haptens will generate unique epitopes that will modulate the generation of antigen-specific CD4+ T cells in CHS and UV T regulatory cells (UV-Tregs), thus altering the magnitude of the CHS response and inducing tolerance to NPs. This research is important from a clinical perspective, as it will answer the question whether NPs can immunologically exacerbate skin conditions like Allergic Contact Dermatitis. Researcher: Lisa A. DeLouise, Ph.D., M.P.D.